Immediately west of the coastline’s famous Cape Hatteras, the village of Buxton, NC, lies on the widest part of Hatteras Island. This section of the island contains something very rare — a densely vegetated maritime forest known as Buxton Woods (formerly known as Cape Hatteras Woods), which stretches through present-day Buxton and Frisco. It is also the highest point on the island. As the highest, widest and most densely vegetated area of Hatteras Island, it is a safe haven that has always been one of the most heavily populated areas. A post office was established at the eastern edge of the woods in 1873, and it was named The Cape. The name of the post office was changed to Buxton, NC, in 1882. Native Americans lived year round throughout this wooded area. It is believed that the Native American colony stretched from the northern end of present-day Buxton all the way through the southern end of present-day Frisco. Before the paved highway was built through the island, Buxton, NC’s, sand roads meandered through the woods under canopies of trees leading to dwellings, the schoolhouse, general stores and churches. Today, most everything in Buxton is centered on the main road, but there are still some homes tucked back in the woods. Part of the woods is now the Buxton Woods Coastal Preserve, and it’s a popular but protected Buxton attraction. 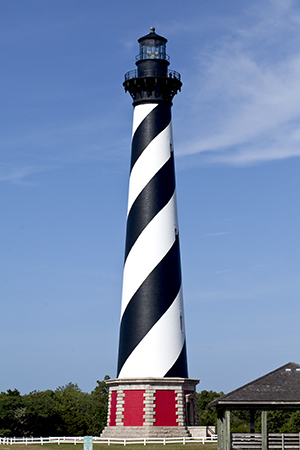 If one thing identifies Buxton, NC, it has to be the famous black-and-white, spiral-striped Cape Hatteras Lighthouse. The lighthouse has become the icon of the island, representing the hopeful, stalwart, survivalist attitude that is so pervasive among the people of Hatteras. This is one of the most famous lighthouses in the nation, especially since it survived a controversial, precarious move in 1999. 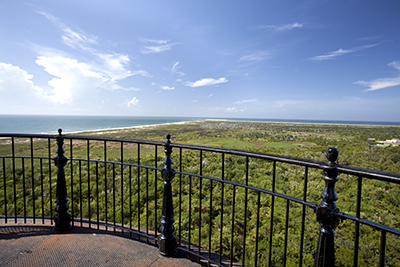 In the hands of the National Park Service, the Cape Hatteras Lighthouse is open to the public. Buxton, NC, is known as a surfer’s haven. The Eastern Surfing Association began holding its annual championships at the lighthouse in 1972, exposing the area to surfers from along the East Coast, and Mother Ocean has drawn them here ever since. But there are lots of other Buxton things to do. Prefer to keep on dry land? Then go mini-golfing, hike in Buxton Woods or on National Park Service trails, play arcades, climb the lighthouse for an amazing view (and workout! it's 257 stairs high), ride a horse along the beach, play tennis, visit the skatepark, settle into some yoga classes, take a guided tour of the island in an air-conditioned van, get a massage or listen to live music. Fishing, in all its forms, is a major draw for many visitors. But, if being in, on or above the water is more your scene, try surfing or kiteboarding (take lessons locally), go SUPing or kayaking or just dive into the ocean and let all your care wash away. Without a doubt, the biggest Buxton, NC, attraction is the Cape Hatteras Lighthouse. The spiraling black and white structure has become iconic, and plenty of people visit the Outer Banks just to see this beacon and the four others found here: Ocracoke Lighthouse, Bodie Island Lighthouse, Roanoke Marshes Lighthouse and the Currituck Beach Lighthouse. From late April through Columbus Day you can climb it starting at 9 a.m. You must measure at least 42 inches tall. Another Buxton attraction is Buxton Woods, a diverse maritime forest that transports you into an environment filled with pine and oak trees amidst swamp forests and marsh wetlands. There are plenty of critters that make this forest home too. It's a place many visitors have no idea even exists on these barrier islands, and it's well worth your respectful visit. Let's start with the local bookstore, a place you'll want to spend hours in. Buxton, NC, shopping spreads out from there. Of course there are seafood markets where you can't get any fresher fish and a well-stocked local grocery store. And of course, with fishing being one of the kings of Buxton activities, there are several tackle shops that have every single thing you need to hook a big one. Then there are home decor shops, several very good clothing stores, surf and water sport shops, garden centers, toy stores, an ABC liquor store and ice cream shops. Several excellent art galleries bring beauty and class to town. Buxton, NC, restaurants are some of the most varied on Hatteras Island. The creativity of the chefs at some of them brings local seafood to your plate in ways you might never have tasted, but the tastiness doesn't stop with fruits of the sea. There are dishes inspired by Caribbean, Mexican and Pacific Rim flavors, organic beef and chicken, hand-tossed pizzas, sandwich shops featuring inventive lunch options, BBQ, burgers and fries and more. Several places are open for breakfast including a bakery that's been there forever and serves Apple Uglies (you have to try one!). You'll find more old-school Buxton, NC, hotels (well, in truth, they're motels – the old, drive up to your door type) left than in any other Outer Banks town. These remaining places have become treasures in and of themselves since most have been torn down and replaced with modern oceanfront mansions in other areas of the Outer Banks. These Buxton hotels give present-day visitors a sense of the simple vacation paradise Hatteras Island was in years past, but plenty of these older properties still provide present-day amenities such as WiFi, pools and hot tubs and kitchens. There are newer accommodation options too, including bed and breakfasts, smaller inns and campgrounds. Buxton vacation rental homes, both big and small, add to the options. What's the word on Buxton, NC, and being allowed to drive on the beach? You’d have to know almost nothing about Hatteras Island to be unaware of the recent controversies over beach driving, and Buxton, NC, has been squarely in the middle of it since The Cape, one of the most popular fishing areas, accessible only by ORVs (that’s off-road vehicles), is here. A compromise was eventually reached between the National Park Service and those opposing the ORV restrictions. 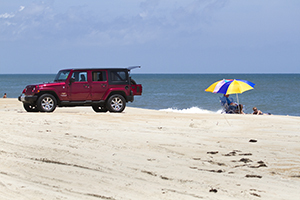 Driving on the beach is allowed in many areas of Cape Hatteras National Seashore. However, a permit is required, and some areas of the beach are closed to driving completely or during the bird-breeding and sea turtle nesting seasons (mid-March to late August for birds and as late as November for sea turtles). Check here for Off-Road Vehicle Use information in the Cape Hatteras National Seashore: http://www.nps.gov/caha/planyourvisit/off-road-vehicle-use.htm. And make sure you get a permit before taking your 4WD onto the beach. The offices to do so are at Bodie Island (just north of Oregon Inlet) and at the Hatteras Island Visitor Center, right in Buxton. The NPS folks will also give you a current map of where you can – and can't – drive on the beach. We know this probably goes without saying, but also pay attention to the 4WD part. You won't believe how many people attempt to drive their plain old car on the sand and – guess what – get as stuck as a car can possibly get. Even some of the 4WDs have trouble in the deep sand here on Buxton beaches. Are there lifeguards on Buxton, NC, beaches? Yes, the Buxton, NC, beach at the Hatteras Lighthouse is guarded from Memorial Day to Labor Day from 9 a.m. until 5 p.m. If you have a lot of kiddos with you and/or if you're not a strong swimmer, it will behoove you to hop in the car and head to this beach to swim or play in the water. The ocean here can be rough at times, so being in sight of a watchful, trained guard is your best bet. What's the best airport to use if we're flying to Buxton, NC? Most people who fly to get to the Outer Banks (and then rent a car because you have to have one to get from the airport and to explore the area) will arrive at Norfolk International Airport (ORF). From Norfolk, it's about a 3-hour drive to Buxton. Increasingly, visitors do fly into Raleigh/Durham International (RDU). That's about a 4-hour drive, but some travelers feel it's an easier airport to negotiate. If you're flying from the western part of the country, the flight times and rates are sometimes better into RDU. What's the weather like year round in Buxton, NC? Buxton's weather mostly mimics its northern Outer Banks neighbors (Nags Head area), but there are a few exceptions. Typically, if the northern barrier islands and Manteo get snow, the Hatteras towns won't. Also, Hatteras Island, because of Cape Point, often is more impacted by hurricane flooding and winds. Does the Outer Banks get much snow? Not really, though you might not believe that from the winter of 2018 when we experienced two big storms that dumped almost a foot each time and one in mid-March that only gave us an inch in some areas (not in Buxton) – but it's still very weird to get snow that late here. Because Buxton is on a barrier island that sticks out into the ocean, the prevailing winds are almost always present, making even the hot days more bearable (but making the cold days a bit more biting). January, July and August are the rainiest months, with the summer rains often being afternoon thunderstorms that douse us then leave quickly.